Become a Foster Parent and help a homeless pet! Fostering a dog means providing a temporary home while we work on finding them a permanent home. Without people like you, we are unable to pull these abandoned animals from shelters and into safety as we do not have a facility nor the funds to board dogs. Fostering a rescue dog is a major factor in a dogs life, a life that may not be possible. All of our rescues come from shelters where they are at high risk of being euthanized. In fact, many will run out of time waiting for a rescuer that will never come. Please help us change that! We cover the costs of all veterinary care. This includes all routine appointments, emergency appointments, preventatives (flea & tick and heartgard) and any medications the dog may need while in your care. Our Medical Director will keep you updated to your medical needs. You have 24/7 access to a foster coordinator in the event of an emergency. We provide collars, leashes and identification tags. (A crate if one is needed). We have a team to screen potential adoption applicants. A healthy and safe environment for your foster dog. Many first-time fosters fear that they will become too attached to their rescue pup to be able to give the animal up when an adopter comes along. Actually, most of our fosters will say that fostering is one of life’s most rewarding experiences–they knew from the start that their home was a landing place for an animal in desperate need. By fostering they had the joy and comfort of knowing that they helped saved a precious life. 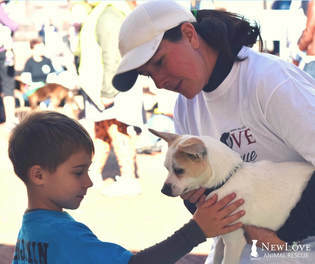 Many of our fosters keep up with the adopters via email, forging a lasting relationship with the pets they helped save. ​How long will I have my foster dog? There is no hard and fast answer to this question. You could have your foster dog for a few days to a few weeks. This depends on a lot of different factors such as the age of the dog (younger dogs get adopted faster), the type of home that is best for the dog, etc. But please note, if you are fostering a dog and have something come up, whether it be planned or not, we will always arrange for the dog to go to another foster home. What should I expect from my foster dog? They could potentially be a little shy or nervous initially. Remember, you, your family and your home are ALL new to them! It may take them a bit of time to get comfortable with all of these new things. So if they pace, drink a lot, or pant don't panic! This is just nerves as their new life is just beginning! When I lost my dog of 13 years, I felt lost. I didn't know if I could have another dog again. My heart felt like I was replacing him. Then I volunteered. I cried with the first couple of dogs but the organization was so kind. Then the feeling of realizing how I was helping others, how I was making families happy, seeing the smiles on their face. It was such an emotional healing and honor to my Sammy Girl. Seven years later and I still volunteer, foster, do what I can.